If these were made of steel how come they all say "use once" i.e. play one side of a 78 then change the needle ? Sheffield, world famous for its steel products, produced the Gilbert, Geisha, Ariel and Songster tins. The wear on the needle is constant and concentrated on the accurately made fine tip. The wear on the record is spread out over many metres of groove wall. While playing a 5 minute record, the needle tip gets 5 minutes of abrasive wear while each piece of the groove is "worn" only instantly as it passes beneath the needle tip. The rate of wear depends on hardness (not strength) of the materials, assuming they are both "smooth" (ie, not cutting surfaces like a file). Steel is actually quite "soft" as hardness makes it brittle. Shellac, used for 78rpm records which were played with steel needles, is actually quite hard which is why the records were so brittle and easily broken. If the record surface is harder than the needle then the needle will take a proportionately higher amount of the wear. With vinyl records (a soft material, not brittle, but easily damaged by scratching instead) played with a diamond stylus (the hardest natural substance) this situation is reversed putting more wear onto the record surface, - however it would take a lot of plays to put a significant amount of wear onto any needle sized portion of the groove due to the very small time the needle remains in contact with it, the wear is not concentrated at a point but spread across the entire record surface. Wear was further reduced on these records by using very low stylus pressures, something that was not always done with 78's, especially with mechanical gramophones were the weight of the horn often beared down on the needle. Obviously pre-Tippex days, as the poor lass in the typing pool couldn’t spell ‘Thornton Road’ correctly either? Nice to see list and chain discount pricing. 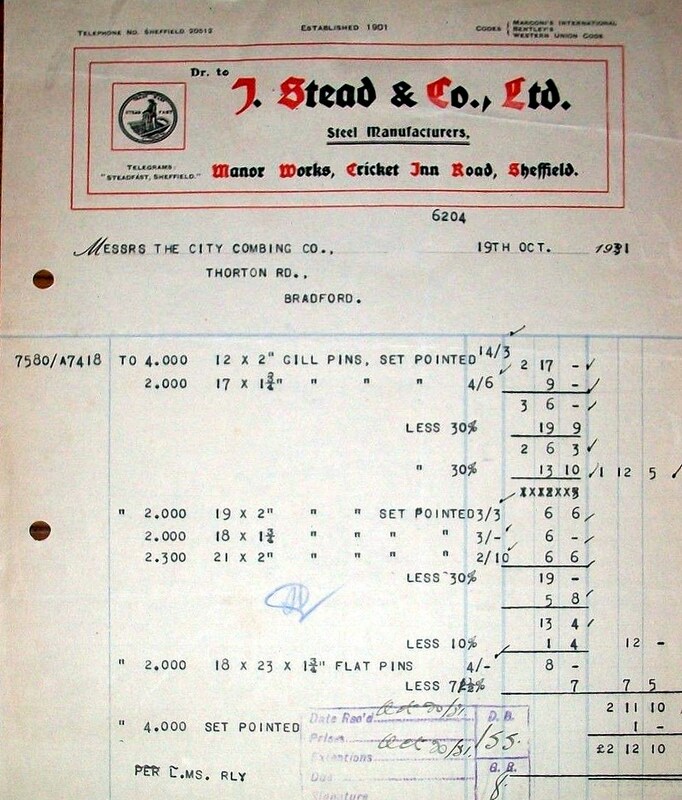 With over 30 years in purchasing of industrial supplies, it was always slightly baffling that we would buy say nuts and bolts at list -25% -10% -73% and in pre-computer days, working out a stock order of 100+ lines was a pain in the backside!